This is Crab's latest MythoUght (number 6 to be precise or MythoUghtus Sextus), which is all about Serena Korda and clouds and guides and subverting the conventional guide using counter-tourist tactics (which is precisely what Crab does best - I speak from experience). Ed. PS This won't be Crab's latest MythoUght for long, because things keep changing. If you want to know when they change, there's a box for signing up lower down in the left-hand column. Also, Crab speaks a lot on Facebook. Here to be precise. You can befriend him if you like that sort of thing, though he is not lonely. Ed. PPS Why not play some crazy cello music while you're reading this Ught? Crab has personally selected it because it provides the ideal accompaniment to the words. Crab is like a musical sommelier matching eargrapes to meatheads. To play it, please click on the tiny little You-Tube jobbie below. Ed. 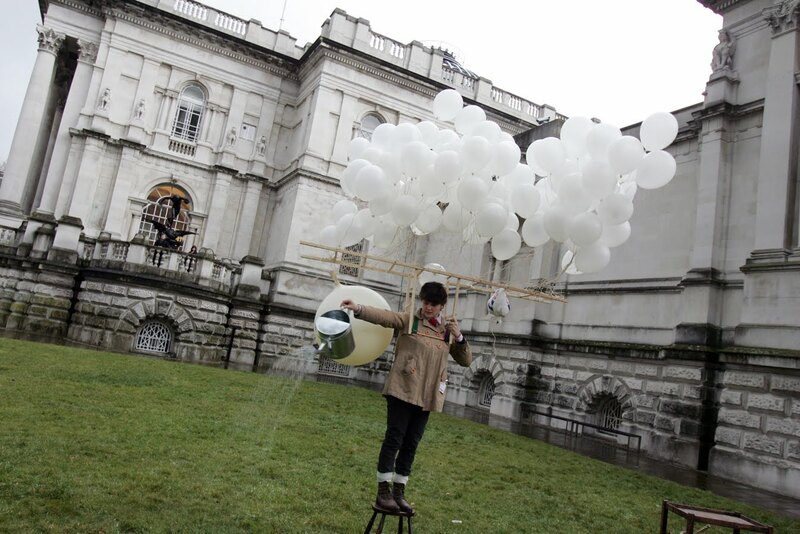 Serena Korda unties herself from the tea trolley and begins to attach herself by harness to a rack of white, helium-filled balloons. This is clearly not the usual conclusion to a guided tour, but then Korda’s tour of paintings of clouds at Tate Britain (London) is far from conventional. Subtly divergent, without histrionics until its final moments of uproarious exhibition, The Namer of Clouds Lived and Died Here is an informal and restrained progress through the gallery, observing many of the conventions of the guided tour while gently pulling them apart, feather by feather, leg by leg. 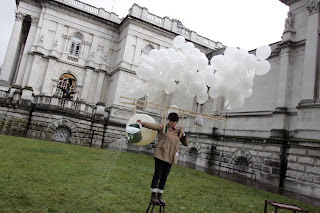 Serena Korda is not one of Tate Britain’s regular guides. Korda is an artist. With Gail Burton and Clare Qualmann, she is part of the ambulatory group walkwalkwalk. Attracted by “the absurd and the impossible”, she describes one of her drives as a desire “to restructure the order and importance placed on certain aspects of our history, highlighting the abandoned bits”. Her tour is partly a celebration of the transient and ephemeral, a shifting of focus away from the centre of paintings to their edges, from foregrounds to backgrounds, and a shift in values – her clouds acquire names and chemical properties, they are not simply surfaces for the reflection of light or the balancing of pictorial mass. They have biographies in which Goethe and quantum mechanics play bit parts. But before the delights of Serena Korda’s tour, there has been time to tag along with one of Tate Britain’s official guides. An hour long progress through the gallery. In its duration and in the nature of its route it is broadly similar to The Namer of Clouds Lived and Died Here. And so at this point I should write, “but that is where the similarity ends”. 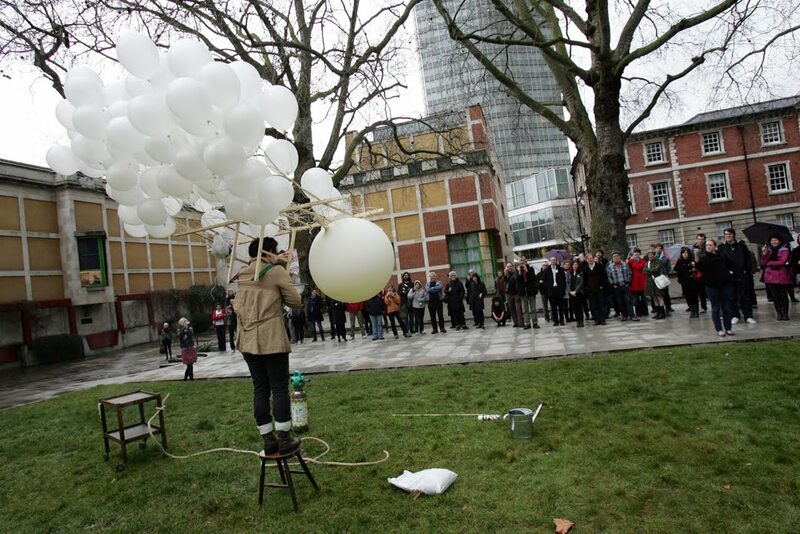 However, the genius of Korda’s tour is that the similarity does not end there – in fact similarity does not end until Korda’s final craziness with balloons and tea trolleys on the ‘Clore Lawn’. What I first experience in its official form, I experience again – eroded and dismantled – with Serena. Our official guide is personable and informal. As we arrive in ones and twos she chats in an amiable way, but she is already ‘working’ us: without interrogation she draws out our particular interests and “do we already know the gallery?” – she is assessing us, remoulding her tour to respond to our dispositions. This is very much part of standard tour guide procedure and in most respects it is sensible and courteous; the guide is eliminating possible repetitions and responding to the wishes of her audience. But there is also something here that lacks resistance and integrity, the dissolution of a creative tension between the ‘expert’ and the curious. Some of the visitors are clearly made anxious by this ploy: it throws back on them a responsibility for the tour which they clearly feel unqualified to accept. The first picture on the tour is a portrait. Sixteenth century. A woman of substance, clearly pregnant. 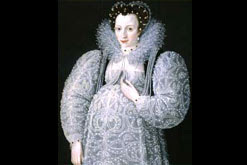 Portrait of an Unknown Lady (circa 1595) by Marcus Gheeraerts II. Our guide points out the tell-tale marks of status and wealth. (This is repeated in the next two paintings, by Des Granges and Reynolds.) And speculates that the commissioning of the painting by the subject’s husband was a taking out of emotional insurance; the acquisition of an image to keep against the possible perishing of mother and child during the imminent birth. Despite this morbid account, it is the subject’s smile that is our guide’s ‘way in’, a means to describe her personal affection for the painting. And for the first time she hits a false note, by ending her account with an emotionally effusive flourish. There is a bathetic pause and then we all move on. This process will be repeated. It as if the guide knows that she has missed an essential connection with us and each time cannot resist the temptation to insert her own connection with the paintings. Somewhere, very early on in the tour, she lost us; a distance has been established between us. Perhaps the gap lies in the hint she gives about the ‘recipient’ of the Unknown Lady’s smile – a suggestion of intrigue, a hint of infidelity that she can’t quite stand up? It feels like a speculation too far – that she is presenting the paintings to us as cryptic clues with soap-opera ‘solutions’. That the ‘authority’ of these portraits rests upon a skilled, naturalistic portrayal of a human nature that has stalled. Or perhaps the distance had emerged even earlier - in the guide’s locating of her tour? Tate Britain is built on the site of a penitentiary, its structure funded by a sugar plantation magnate, designed in a then fashionable neo-classical ornament: which, we are informed by the guide, gives the building “authority”. Henry Tate’s interest and investment in the public display and ownership of contemporary art is presented as something surprising; perhaps the diffident Tate was ‘encouraged’ by his wife, it is suggested. Tate’s sugar cubes – the innovation that set his business part – were personified in the figure of Mister Cube, who became the poster boy for a range of conspiratorial free enterprise movements (Freedom Association, Aims For Industry, Economic League) from the cold war 1950s through to the 1980s when Thatcherism came out of the closet and did their business for them in the open. But from our guide we learn only sufficient of this to suspect that we are not being told enough. “I can feel the chill” says the guide, as she delivers a neat narrative twist, having lured us into an assumption that the second painting we visit is a conventional family portrait: the presentation of a child to a bed-ridden relative. 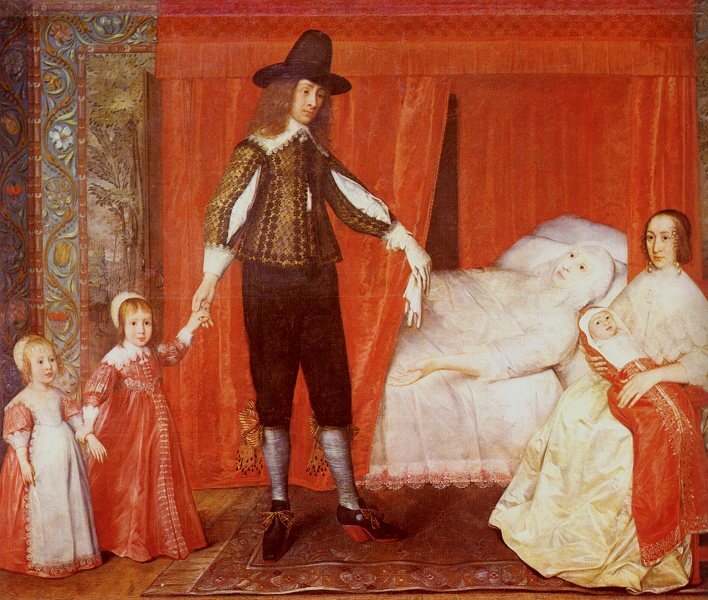 In fact, David Des Granges’s ‘The Saltonstall Family’ (circa 1636-7) is an absurdity, an impossibility – the presentation of the child of a second wife to the (apparently living) corpse of a first. Time has been messed with, shifting along different planes. By presenting what is a narrative of developing scholarship as a sudden switchback in her account, the guide vivifies a moment of disrupted understanding. But she then seals it away again, as a curiosity, a macabre glitch in portraiture’s conventions of authoritative naturalism. There is more than a dead wife that is strange about this painting. The illusion of depth in the room operates impressively up to the edge of the bed and carries on within the bed and its canopy. The rest of the room, beside and behind the bed, is a two dimensional frame. On the rear wall, a painted rural scene is unreal, suggesting painted stage scenery. If this is down to the painter’s provincial naivety (as Tate Britain’s official account maintains), then it is at odds with the psychological sophistication of the portraiture. And it seems meaningful: the dark portal of the bed is like a recess in material space itself, a morbid trapezoidal shadow that lurks inside (and is more ‘real’, more dimensional, than) material things, suggesting that the authority of the painter and the authority of the objects and marks of status and wealth are not necessarily the same quality at all. The Reptilians Are Among Us! Where our guide struggles most, however, is when she moves from analysis to advocacy. The troubled biographies of 18th and 19th century artists predominate. John Constable’s low born status is emphasised. J.M.W. Turner’s opportunism and commercial ‘nous’ are highlighted. The guide quotes a description of Turner’s manners as being like those “of a reptile”. The portentous clouds in Constable’s ‘Chain Pier, Brighton’ (1826-7) are symbolic of class obstacles to Constable’s marriage to a well-born wife. The guide seeks to reinstate (if not crank up) the “authority” of the art by contrasting the material (class) troubles of these artists with a romantic, non-material notion of their genius. Turner’s ‘Fishermen at Sea’ (1796) is not a painting “of light’s effects, but of light itself”. We are in very familiar territory now – unable to gain value and ‘authority’ through the patronage of (or location among) the wealthy, the romantic turn to various ‘Natures’, claiming for its spirit or ideal what they cannot claim for power. Serena Korda ends her tour in an almost identical fashion, making an attempt upon the transcendent; she tries to turn herself into a cloud. But by choosing all the wrong resources – or rather all the right resources in the wrong proportions – she emphasises the feasibility of the transcendent, of genius as an everyday act. She makes the connection through absurdism that the official guide cannot make through empiricism and commonsense. She demonstrates an impossible and absurd that is part of the everyday. But she does not achieve this alone. It is part of the dispersive success of her tour that she shares the achievement with others; combining empiricists who, together, produce something that is both at odds with, and more elusive than, their parts. It would not be difficult to describe Serena Korda’s The Namer of Clouds Lived and Died Here as a linear progress similar to that of the official tour. One can list the presenters and the paintings (with clouds) that they either address or nod to: Howard and Sylvia Oliver on Luke Howard’s classification of clouds, Professor John E Thornes’s account of one of John Constable’s cloud studies, Professor Giles Harrison on electro-magnetic effects in 'The Great Day of his Wrath' (1851-3) by John Martin, Professor Maarten Ambaum’s meditation around Turner’s ‘An Avalanche in the Alps’ (1803) and Gavin Pretor-Pinney’s disquisition on the principles of The Cloud Appreciation Society, backed by John Linnell’s Contemplation (1864). But this is to deceive. For, by dividing the tour into separate episodes (and then providing its final act) and by introducing numerous voices, Korda creates a layering effect rather than a progression or narrative. The different informations seem to sediment one upon another, slowly revealing a contoured floor. It is against this uneven terrain of ‘authority’ that the audience are invited to contrast or conflate the contributing experts, while the whole experience is pleasingly defamiliarised by the use of headphones. The voices of the experts become too intimate, whispering demons at our ears, while the paintings move no closer, open no wider. This ‘separation’ substitutes for the official tour’s subtraction: bounding the different regions of knowledge denies any discourse a dominant plane. Instead of a shrinkage, Korda’s dispersals expand the meanings of the parts, each one moving about the others, revealed by their relation to each other. 1. CIRRUS. Parallel, flexuous, or diverging fibres, extensible in any directions. 2. CUMULUS. … increasing upwards from a horizontal base. are realised in the playful lifestyle idealism of Gavin Pretor-Pinney. Instead of formulae about authority and genius, these trajectories and changes of key are topped by a failed transformation. The sudden change of location and tenor for the final act comes as a surprise – the surprise being that it is such a logical extension of what has come before. Where the performance artists Lone Twin once performed the virtuoso transformation of a river into a cloud by hurling buckets of its cold water at their overheated bodies, there is only the poetry of the machinery here. Neither the different academic interpretations of the paintings, nor the brief histories of ideas, nor the gestures to the constituents of ‘cloud’ – rain from a watering can, a scattering of flour for snow – has brought us any closer to an authoritative account or a physical “genius”. The humiliation is provided by the physicist Ambaum, who brutally lays into positivism and celebrates the unpredictability of clouds, the instability and eccentricity of complex forms made from simple parts and patterns, and rejoices in the humbling acceptance of a non-mysterious inaccessibility, of NOT knowing how simple beginnings might turn out: chaos, in other words. Thornes, on the other hand, presents a super-confident and empiricist presentation of a Constable cloud study, a painting not seen publicly in Constable’s lifetime, for it was not located, it was not ‘pictorially’ or narratively framed, it was a piece of chaos, of unmeaning, and yet still a thing, a thing to be kept hidden away. What we had assumed was some kind of practice piece – in fact the Constable cloud studies do not match any of the clouds in the artist’s completed paintings - turns out to be an immersion by the artist in a forbidden Zone of imprecision, unrespectability, amorality and unpredictability. Neither of these two wonderful (and climactic) mini-presentations could have made their impact without attendant moments of suppressed hilarity: Thornes’ product placement of his own (out of print) book and Professor Harrison describing in great detail the characteristic chemical cloud structure and electrical behaviour of what was, very clearly, an immense structure of rock in John Martin’s epic painting of the Last Judgement! (All the more precious for following on so quickly from the indictment of Martin’s zig-zig lightning.) Rather than finding disappointment in this lack of accuracy or observation, here was a metaphorical affordance. Changes of state and chemical re-compositions were spreading their meanings. The mist could gather around errors too. The dispersed form of the tour had allowed its details to reach out to its edges. Where the official tour was always under pressure to lead to something – some critical understanding or aesthetic embrace of the right things – in The Namer of Clouds Lived and Died Here the understanding was equivalent in form to its subject. Serena Korda’s achievement was to channel the voice of the expert guide, divide it up, defamiliarise it and the mechanics of listening to it, and then, as ‘guide’, to absent its ‘authority’ through the simplicity of her own greeting, pointing, linking, helping, tangling, introducing and thanking. Unlike the official guide’s gentle interrogation of her audience and receptiveness to their inclinations, there were no such concessions in The Namer of Clouds Lived and Died Here. The experts had their expertise. And that is what we got. And there was something gratifying about the obstinacy of their expertise. From a lone expert, this might have been oppressive, but given their brief episodes and the juxtapositions of their voices and narratives, the ‘expert voice’ fragmented enjoyably. Korda’s guiding was an act of assemblage, the deferral of the voice of final authority. She did not even displace it to the building. Or to the paintings. Nevertheless, her tour was ‘shaped’. The build up to ‘chaos’ was deft, disguised and essential. It could only be followed by whimsy. Only fancy – the mixture of the fantastic and sudden and illogical change - could return the oily clouds to their transitoriness. Significantly, Serena Korda never disavowed or silenced the empirical or expert voice. Rather, she managed her tour so that the strain on the guide, snagged on authority while reaching for advocacy in gentle desperation, (for there was nervousness as well as arrogance) was returned to an impossibility even before she began her attempt to rise into the sky. The parts of the tour had already become absurdities in themselves, their connection to individual paintings made mildly comical, and yet together, without a voice of either authority or advocacy, they had created a whimsical evangelism for vapours. Serena Korda does not float. And so the idea of a cloud can.